Now, let us use the app to find the exact values of the six trigonometric ratios for 45° or π/4. Enter each trigonometric ratio as it appears. Type one ratio per line. Add degree symbol after typing the angle measure. Alternatively, activate the DEG unit by tapping the DEG-RAD button on the upper right of the calculator display. If you want to use π/4 , make sure that the DEG-RAD button is swift to RAD. 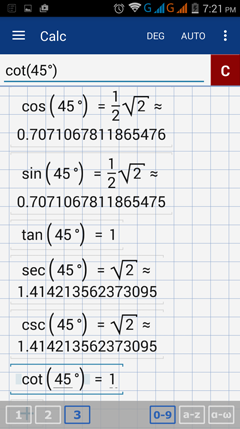 We now use this special angle to find the exact value of a trigonometric ratio of an angle that is a multiples of 45° or π/4. Find the exact value of each trigonometric ratio below. Note: To manually solve for the exact value of each given trigonometric ratio, one must find the reference angle or use the unit circle. The succeeding solutions uses the App instead. 1) Enter cosine by tapping cos key once. Type 135 and add the degree symbol. Note: 135° is an angle in standard position whose terminal side lies in quadrant II. Thus, cosine value is negative. 2) Enter sine by tapping sin key once. Type -135 and add the degree symbol. Note: The terminal side of -135° angle lies in quadrant III. Thus, cosine value is negative. 3) Enter tangent by tapping tan key once. Type 225 and add the degree symbol. Note: The terminal side of 225° angle lies in quadrant III. Thus, tangent value is negative. 4) Enter secant by tapping cos key three times. Type -225 and add the degree symbol. Note: The terminal side of -225° angle lies in quadrant II. Thus, secant value is negative. 5) Enter cotangent by tapping tan key three times. Tap DEG button to activate RAD unit. Type 7π/4. Enclose the arguments in parenthesis. Note: The terminal side of 7π/4 angle lies in quadrant IV. Thus, cotagent value is negative.